The Bora is a booted Golf that’s really no more posh than the Golf upon which it’s based. It’s a good looking car though, and the Bora’s boot is massive, too. It’s worth looking at its close, and cheaper, SEAT Toledo or Skoda Octavia relations, but they lack the cachet of the Bora’s VW badge. In the late 1990s Volkswagen decided it needed a saloon car to slot in under the Passat with a bit more gravitas than the Jetta. The Bora was born. It almost worked too, as despite being very closely related to the Golf hatchback the Bora managed to feel a bit more special than it perhaps had any right to. 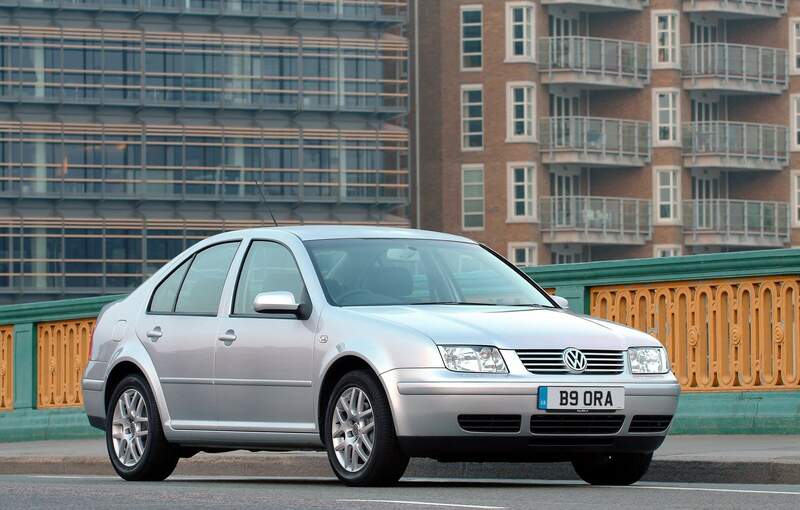 Impeccable build and neat styling appealed, but the Bora is no more as the Jetta fulfils VW’s booted Golf role today. When the Bora was launched in 1999 Volkswagen spent a lot of time denying that it was little more than a saloon booted Golf. That’s exactly what it is though, the differing headlamps, grille and that notchback saloon rear unable to truly hide the Golf’s DNA. However, that’s not necessarily a bad thing, as Volkswagen’s reputation for solid build and reliability permeated the Bora, with near premium car levels of quality. Unsurprisingly, the engine range largely echoed that of its hatchback Golf relative, with four-cylinder petrol and turbodiesel engines, as well as a flagship V5 five-cylinder 2.3-litre unit with 150hp. The V5 was replaced by a turbocharged 1.8-litre with 180hp, the entire engine range increasing in output and improving in emissions and economy until production finished in 2006. Trim levels consisted of S, SE, Highline and Sport, all featuring a decent standard level of specification to try to justify the Bora’s slightly elevated price point - in comparison to the Golf. Five- and six-speed manual transmissions were standard, with a four-speed automatic offered with the 1.6-litre petrol and a five-speed with all the other engines. Forget the petrol engines; it’s the diesels that are the most sensible choices. A 1.9 TDI in SE specification will do the job nicely, combining decent performance with wallet-friendly running costs. That 1.9 TDI came in a number of output levels from 100 - 150hp so be sure to check which one you’re getting. Economy doesn’t suffer if you go for the highest output version either, as the 130- and 150hp engines share the same 5.5 litres/100km consumption figure, the 100hp using 5.3 litres/100km.